Chinese chess grandmaster and the Chinese Chess Champion. On 6 June 2009, at the age of 16, he became the youngest ever person to win the title of Chinese Chess Championship. 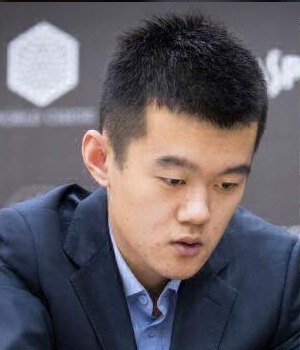 Ding is a three-time Chinese Chess Champion (2009, 2011, 2012). and as a member of Chinese team at Chess Olympiad he won gold medal in 2014. He also won team gold at the World Championships in 2015 and in last Chess Olympiad in Batumi. In August 2015 he became the second Chinese player after Wang Yue to break into the top 10 of the FIDE world rankings. In July 2016 he was the highest rated Blitz player in the world. As of June 2017, Ding's peak rating of 2783 (in June 2016) is the highest rating that any Chinese player has ever attained. His participation in the Berlin tournament earlier this year made him the first Chinese player to qualify for the Candidates Tournament. Ding was undefeated in classical chess from August 2017 to November 2018, recording 29 victories and 71 draws. This 100-game unbeaten streak is the longest in top-level chess history.